If you need separation advice, the following information can help. Many people wonder why they should go through the hassle of getting a legal separation instead of just agreeing to live apart. One of the main reasons to get a legal separation is to protect your interests until you either divorce or get back together. Since some states require a period of separation before an uncontested divorce will be granted, a legal separation can spell out to how everything will be handled in the meantime. A separation agreement can outline where you and the children will live, address temporary support and visitation schedules, and determine how the assets will be split, bills paid, and mail handled. A legal separation can also help protect you from being held responsible for your spouse's debt, liabilities, and taxes after the date of separation. Unfortunately, not all states recognize a legal separation. These states include Delaware, Florida, Georgia, Louisiana, Mississippi, Pennsylvania, and Texas. But, you can file for temporary orders when you file for divorce as a way to protect yourself until your divorce is finalized. The FAQs below can help answer your questions about legally separating. Are people legally separated if they've been apart for years? Are we separated if we've never lived together? Would we be legally separated if we're going through a divorce? Am I still married if he married someone else? Is it reasonable to not divorce until one of us wants to marry again? Are we considered divorced if we've been apart for so long? Can I still get divorced after we've been separated for 10 years? Is a legal separation wise if you're not sure about divorce? Should I get a legal separation while he's in a mental facility? Can we withdraw the legal separation and file for divorce instead? How do I prove we've been separated for a year as the grounds for divorce? What rights do I have with a legal separation? How much does it cost to get a legal separation? How can I file for a legal separation if I'm broke? Is there a timeline for a legal separation? Do I qualify for a legal separation? How is custody handled during a separation? What can I do if legal separation isn't recognized in my state? How do I fight to change my state laws to allow legal separation? How is notification sent for a legal separation? Who do I contact to find out if separation papers were filed? Is the separation agreement binding if the papers were never filed? Do both spouses have to sign a separation agreement? Can he file for a separation without my signature? Can a legal separation agreement be modified? Can a legal separation be dropped if a couple gets back together? Is a separation agreement still valid after a brief reconciliation? How do I enforce the separation agreement? Can we both live in the same home while we're separated? Can I make him to move out during a trial separation? What do I file to make him move out? Can he make me move out of our apartment if we separate? Can I specify that I get the house in our separation agreement? Is a legal separation required before I move out with the kids? Does the house have to be sold during a separation? Do I have to pay rent to him if I own half of the property? What are my obligations to help pay for his living expenses? Should I continue to pay all his utilities while we're separated? Should I take over the mortgage payments if were not divorced yet? Will he be responsible for half the mortgage while we're separated? Can he get half of the house I intend to buy during our separation? Is he entitled to any equity if I bought a house while we were separated? Do I need a quitclaim deed to have the property transferred to me? Are marital assets split after separation considered separate property? Was the realtor required to inform me he leased a property? Does he have any right to my money if we sign a legal separation? Will assets obtained after a separation be deemed marital property? Is he entitled to part of the business I started after we separated? How do I get him to support us while we are separated? Is child support owed if our state doesn't recognize legal separation? Can I count on a verbal agreement while we're separated? Will he have to pay the mortgage during our separation? Health insurance coverage during a legal separation. Can he be ordered to keep the life insurance during separation? Does he have any financial obligations if he moves out? I'm a stay a home mom and he refuses to pay rent after moving out. What happens to his estate if he should die while we're separated? Would l be entitled to his social security benefits? Can you date while legally separated? Is it okay to date before I get divorced? Can you get engaged during a legal separation? Can I get remarried if we've been separated for 7 years? Can you marry someone else when you're legally separated? Will it have any effect in my divorce if I move in with someone? Does he have a right to tell me what I can do while we're separated? Can I go back to using my maiden name during our separation? How do we file our taxes if we're legally separated? Can he make a will during our separation? Can my spouse legally move to another state? Brette's Answer: Legal separation is not available in every state, so you will need to check to see if it is an option in yours. In a legal separation you basically do everything involved in a divorce, except at the end you remain married in name only. Your assets are divided and alimony is determined. You live separately. Some people use it as a way to try out what divorce feels like. Others use it because they don't believe in divorce or aren't ready. Caitlin's Question: I am married to a UK resident, and we have never actually lived together. We have decided to end our relationship and I am not sure if we are separated or not. Also what other issues may arise with him not being in the country? Brette: You'll have to have him served which could be complicated. You're physically separated, but not legally separated. Sounds like you might qualify for an annulment. Are we considered legally separated after being apart so long? Kathy's Question: We have not lived together for over ten years, but never filed any separation papers. Would be considered legally separated after all these years? Brette's Answer: No. To be considered legally separated, a court must issue a judgment of separation. Am I legally separated if we're currently going through a divorce? Mary's Question: Would I be considered legally separated if my husband and I are currently going through a divorce? Brette's Answer: No. A legal separation and a divorce are two separate processes. Betty's Question: We got married twelve years ago and he went to jail three months later. He stayed in jail for a year and after he got out, he married someone else in the same court house where we filed our paper work. Does that mean we are still married? Brette's Answer: Unless you were granted an annulment or divorce, you are still married. Good luck. Audrey's Question: My husband and I have agreed it would be better if he did not live at home. We are not rushing to get a divorce because our separation is amicable; there are no arguments about the kids, and because of the expense and health insurance issues. Our theory is that if either of us wants to get married again someday, we'll get a divorce then. Is that reasonable or are we dreaming? Brette's Answer: A lot of people who cannot afford a divorce choose to do this. It works for some people and not others. You will still have financial liability for each other's debts which could be a problem. Are we considered divorced after being separated for so long? Laura Asks: We've been separated for 19 years. I have wanted to get a divorce but have not had the means to do it. A friend thinks since we were separated for so long, we were already considered divorced. Is this true? Brette's Answer: You're not divorced until a court decides you're divorced. For this to happen, you need to file for divorce. If we've been separated for 10 years, can I still get a divorce? Cheryl Asks: I've been separated for 10 years and we own a house together. Can I still get a divorce? Brette's Answer: Yes you can get a divorce even after your separation. An attorney can discuss the grounds available to you. Is a legal separation wise if you're uncertain about divorce? Diane's Question: Is a legal separation wise if you're still working on the marriage and living together, but can see it's probably not going to work? I just want to protect myself from any possible stupid moves that my husband might make. Brette's Answer: It would be a good idea for you to talk to an attorney so that you can understand the legal ramifications of a legal separation in your state, and the impact that may have on your divorce. In some instances, doing a legal separation first when you aren't certain can allow you to work out all the financial issues, so that when and if you are ready to divorce, there is not much left to decide. On the other hand, it may add expense to your case. You may wish to see a marriage counselor to help you decide if you wish to save your marriage. Ness' Question: I have been married about a year and my husband recently had a nervous breakdown for which I had to commit him to a psychiatric facility. I have decided, and he has agreed, that until he deals with his issues and gets better that a legal separation is the best thing for us. Does a legal separation mean that I can no longer make medical decisions on his behalf should he become incapacitated for any reason such as his mental illness or say a car accident? We both have made it clear and written what our wishes are should something like that happen, but will I still be the one that can legally make those decisions if we are living apart and legally separated? Brette's Answer: Why don't you wait until he comes out to do the separation? He may not even be considered competent at this point to sign legal papers. If you can't wait, he can execute a health care proxy or health care power of attorney giving you the authority to make medical decisions for him. His facility may even be able to provide you with the form. Can we rescind a legal separation and just file for a divorce? Gabbie's Question: Can you rescind a legal separation and opt to file for a divorce? Brette's Answer: You can convert to divorce using other grounds. If the papers have been filed with the court you will need to follow your state's process for amending them. It should not be costly. N.C's Question: Six years ago my husband quit his job and has not worked steadily since. I want a divorce, but I do not want anything from him. We've been living apart for a year. How do I prove this since he's still getting his mail at the home address? I live in SC; the year's separation is going to be the reason for divorce. Brette's Answer: Generally you do not need to provide proof of a separation, other than your sworn statement that you have been separated. You should consult with your attorney about the requirements in your state. Janice's Question: My husband decided about 9 months ago that he no longer wanted the responsibility of our home, so he decided to move. I was given 2 weeks to find somewhere to live because he moved in with his aunt. He provides no support for me and I am barely making ends meet. What rights do I have in a legal separation agreement? Brette: You have the right to a property settlement of the assets and debts of the marriage, as well a right to spousal support, depending on your circumstances. He had no right to tell you that you had to move. I would suggest you talk to an attorney as soon as possible so that you can understand your state's laws and discuss what the best step is for you to take next. Karin's Question: How much does it cost to get a legal separation, rather than just get divorced? Brette's Answer: There is no simple answer to this question. Generally, people seeking a legal separation are in agreement, so the costs you face are about the same as an uncontested divorce, maybe a little less. However, if you get a legal separation and later want a divorce, you then have added costs, whereas if you just went for a divorce right away, you would have only one set of costs. Carla's Question: I need to know how to go about filing separation papers when we literally live payday to payday. All we have is the money in his account and his paycheck is our only income because I’m unable to work. Brette's Answer: Check your state court web site. You should be able to locate the papers you need to file there. You don't need to have any real assets to file. The agreement will divide up what you do own. You may be able to apply for "poor person" status and have the filing fee waived so check into that. It would be a good idea for you to talk with an attorney at a free consultation about your rights, since you may be entitled to spousal support. Topic: What is the timeline for a legal separation? Tasha's Question: I am unsure of what the timeline is for getting a legal separation. I have filed and he has been served. I was told that he has 30 days to respond. A "case management conference" has been scheduled three months from now. Can we avoid going to that conference if we agree on the terms before-hand, or do we have to go before the Judge to grant settlements? I was told that it's best to avoid going to court. What is the difference between a full hearing and the case management conference? Can both or just one be avoided? Cindy Asks: We've been married for 7 years and he has been working out of the country for the past 5 years. My husband and I have had quite a lot of issues over the past 2-3 years. I don't think I want to take a step as drastic as a divorce, for social and religious reasons. But emotionally I am empty and drained, hence, am considering a legal separation. Do I qualify for that? Brette's Answer: Check with an attorney. Legal separation is not available in every state. What if my state doesn't recognize legal separation? Lori's Question: Since a legal separation is not recognized in Texas how can I keep myself insured through my husband and make him pay support for me (apartment, bills, food, etc.) during the time of separation if it comes to that? Katherine's Question: I live in Mississippi, which has no legal separation laws, and I am going through a potential 2 year divorce. How do I begin the fight to change the laws in my state...for myself and other women? Brette's Answer: Talk to your state representatives and senators who go to your state legislature. Contact the state chapter of NOW and ask them to help you. Talk to other women and women's organizations. Topic: How is notification sent for a legal separation? Darla's Question: My husband moved out of state last winter. He emailed me and said that he sent in the paper work for legal separation. It's been two weeks, and I still have not received any notification. How long does the process usually take and how will I be notified? Brette's Answer: If your husband is seeking a separation agreement, the papers need to come to you, but it would depend on how long it took his attorney to complete them. If he filed for a separation action in court, you would need to be legally served. Ask him what he did and which court and call the court or the attorney and get some information. Good luck. How do I find out if separation papers were filed? Sandy's Question: I was told that my husband filed for legal separation. I was never served papers for this or knew anything about it. My husband died unexpectedly a couple of weeks ago. How do I find out? Who do I contact? Brette's Answer: If he passed away before an order was entered, it shouldn't matter where or if papers were filed. If you still want this information, you should call the clerk's office for the court in his county that handles divorce and separation. Is the agreement binding if the papers were signed but not filed? Amanda's Question: I just found out that the court never received the separation agreement that was supposed to have been entered 3 years ago. Even though both lawyers signed it, it was never given to the courts. Is it still a binding separation? He has not been paying the support ordered because of it. Brette's Answer: The attorney handling this should have noticed that a court order was never put into effect. Smells like malpractice to me. An attorney can help to establish what your state law permits now. Topic: Do both spouses have to sign a separation agreement? Melissa's Question: To be legally separated do BOTH parties have to sign the papers? Or can just one of us sign them? Brette's Answer: Both parties have to have notice of the proceeding. If one does not answer or appear, it can proceed without him or her. Tina's Question: My husband has obtained an attorney and has legal separation papers that he wants me to complete and sign. I am not willing to agree to the separation agreement and will not sign it. Can he file the separation without my signature? Brette's Answer: No. A separation agreement is just that - an agreement. He can, however, file for a separation or divorce. You have the opportunity to contest it, but ultimately the judge decides if a divorce or separation will be granted. In general, a grounds trial (a trial as to whether or not there are legal grounds for divorce) is a waste of everyone's time and money. If one person definitely wants to end a marriage, it is nearly impossible to repair it. Good luck. Can a legal separation be withdrawn if a couple reconciles? Christine's Question: If a couple files for a legal separation, but they decided to reconcile, can it be voided? Brette's Answer: Yes if you have filed for a separation, but it has not been granted yet, you simply withdraw the papers and the case is over. Is the separation agreement still binding if we briefly reconciled? Barbara's Question: My husband abandoned me and I got a legal separation in Georgia. We lived apart for eight months. He is an alcoholic and was drinking heavily while we were separated, and I was worried that he was depressed and possibly suicidal. I moved to another state and allowed him to move back in with me for a time while he got psychological counseling. I did not consider us reconciled. However, he soon abandoned the counseling, is now gone again, and I want to use our separation agreement as the basis for divorce. Is this possible? Brette Answers: You need to consult with a local attorney to determine what your status is and whether the reconciliation affects your ability to file. The rules regarding divorce are different for every state. Good luck. Can a legal separation be modified? Celeste's Question: We have a legal separation and agreed to not touch each other's retirements. At the time, we thought our home would be sold and all debts paid off. It still has not sold and we are on the verge of filing bankruptcy. We have agreed that he will give me money out of his retirement to help support our children since I'm not currently receiving child support. If we don't do this we will lose everything. Since we are both mutually agreeing to this can, we get the legal separation modified? Brette's Answer: Most definitely. Just create a modification to the agreement and file it. How do I enforce a separation agreement? Marie's Question: If I have a separation agreement outlining visitation, am I able to enforce it using police if necessary? The agreement was done through lawyers and a mediator. Can I make him move out during the separation? Katherine's Question: Our relationship has become intolerable and I have asked my husband for a trial separation to give us time to think about our lives together and apart. Can I force him to move out for a trial separation? Brette: You would need to go to court to obtain sole occupancy of the home. You should talk to a lawyer, but you and your husband might want to see a mediator to see if you can work out a trial separation on your own. Good luck. What do I file to make him move out of the house? Maree's Question: What type of papers should I file to get him to leave so I can file for divorce? Brette's Answer: You want sole occupancy of the home. The kind of paper you file will vary by jurisdiction but is likely a motion paper. Can we still live in the same house if we're separated? Mary's Question: My husband and I want to get a legal separation but, neither one of us can afford to move. We have a two story house and he could move to the down stairs. Would this be legal? Brette: It will depend on your state definition. Usually you must agree to "live separate and apart". However, there is really no one who is going to police that. Talk to an attorney so that you can understand your state laws and go from there. Can he kick me out of our apartment when we separate? Jodi-lynn's Question: We are splitting up and have a two year old son together. He is saying that he is kicking me out of our shared apartment without my son. Can he do that, and what can I do to stop this? Brette: It depends whose name is on the lease. If it is both names, you each have an equal right to be there. If it is in his name, then he has the authority to tell you to leave. If it is in your name, he has no right to be there. I highly recommend you go to family court to get custody and child support established. Good luck. Can our separation agreement say that I get the house? Kara's Question: We've been married 13 years and are going to get legally separated. He does not want our house, but I do. Is it possible to include this in our legal agreement? Can I get him removed from the deed and keep my house? Brette's Answer: If you both agree that you should have the house that can be included in your separation papers. The deed can be transferred to your name alone. Good luck. Do I need a legal separation to move out with the kids? Arin Asks: Do I need to have a legal separation agreement on file in order to move out with the kids? Brette's Answer: No. Many people physically separate without any court involvement. 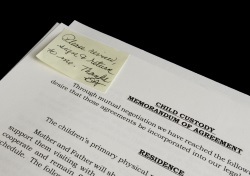 If you want something official, file for an order of custody with family court. Rachel Asks: My father walked out on my mother 1 year ago to live with another woman, and he is trying to force my mother to sell their home. Is there a time period for this (no one has filed for divorce as yet)? Brette's Answer: Nobody can force anybody to sell the home at this point. It can be sold as part of the divorce once that gets going, but at this point they both must agree to sell it. Helen: My husband and I recently separated after 24 years. I am living in the marital home with our 2 teenage children. We have no mortgage on the house, but he is now living in rental property. He wants to charge me rent for his share of the property. Is he allowed to do this and do I have to pay rent when I own half of the property? Brette's Answer: No, until there is a division of marital property in court you are both entitled to stay at/own the home. I suggest you speak with an attorney so you can get things cleared up. Ruth's Question: My husband and I separated nearly a year ago. I moved into my sister's house with my two children and he stayed in the marital home as he claimed he had no place to go. He is currently paying the mortgage but feels I need to pay as well. In addition to the mortgage, he wants me to pay utilities that cover TV, phone, internet, home heating oil, and electricity. I have a problem with this. We are living in my sister's living room (and I pay her money for staying in her house) while he occupies a 4 bedroom home and pays me no child support. What are my obligations to pay him? He told me that if he got an apartment I would have to pay for half of it. Well in a way he has an apartment and he is still looking for me to pay half. Brette's Answer: I think you should see a lawyer and get this worked out officially. You need to have some temporary financial arrangements worked out during your separation. You are entitled to child support. You can also ask for spousal support. The mortgage is a marital debt and has to be apportioned in some way, but if he is working and you are not, you would not be expected to contribute. I think you need to change how you're thinking about this situation. Stop trying to be nice and stand up for your rights. T's Asks: I moved out of our house due to severe and escalating emotional (i.e. death threats) abuse. I also got a protection order and filed for divorce. I am paying all the bills at the house while he lives there because he still takes my kids to and from school (I work and he does not). He thinks that he will get full custody, child support, and alimony since he can prove he is living at the house, and mostly taking care of the kids. Should I continue paying all the utilities (I will pay the mortgage one way or the other) to show that I am paying the bills? Brette's Reply: You need to speak with an attorney about the particulars of your case. Paying all the bills shows the court you are able to do so and makes it likely the status quo will be continued. Should I take over the mortgage if were not divorced yet? Kim's Question: Just last week my husband filed divorce papers and he wants to move out ASAP. His lawyer says he may do so, and she will write something into the divorce paperwork stating options for him to move and me to take over the mortgage payments. I think us moving apart is the best thing for both of us, but want to make sure this is ok before everything is finalized. Brette: Most couples separate before the divorce is final. However, you need to have your own attorney to review the paperwork and discuss your options. It is not smart to rely on your spouse's attorney, who is only looking out for his interests. You should not agree to take over mortgage payments without an attorney discussing your options and your rights with you. C's Question: My husband was ordered to move out due to domestic violence. My name is on the note and his name is only on the deed. Should my husband be held responsible for half of the mortgage payment until the house sale? It doesn't seem fair that he would be able to walk away from the loan. Brette Answers: The mortgage is a marital debt and the home is a marital asset. Both must be divided in the divorce. You will get credit for payments you have made since the separation. Talk to an attorney. Daniela: I'm separated from my husband, but not yet legally. If I want to buy a new house using only my name, is he going to have any right to that house or is going to be only mine? My fear is that when we are going to separate legally he will ask for half of the house that I am planning to buy. Brette's Answer: If you use marital assets to buy the home, it is a marital asset. You ought to consult an attorney before doing anything. Nat's Question: I’ve been separated from my husband for 11 yrs. and we haven’t bothered getting a divorce as neither of us plan on marrying. If I purchased a house about 3 years ago, is he entitled to anything if we get divorced? The house is solely in my name. Brette's Answer: The question would be what funds were used to purchase it. If they were marital funds, then those funds would be considered in the division of assets. Are marital assets split after separation deemed separate property? Leslie's Question: We're separated and are splitting our liquid assets. After we split the liquid assets into our own separate accounts, is that money now considered separate property? We plan to mediate, and we are in California. Donna's Question: We're separated, but I thought we were working on getting back together. I found out he secretly leased a property with his mistress. The broker agent knows both of us as a couple. Did the realtor do anything ethically wrong that I can complain about since this is community money being used to fund this? Brette's Answer: No. The realtor has no responsibility to you and your husband has every right to use marital funds during the marriage. Do I need a quit claim deed to have the property transferred to me? Leslie's Question: I recently became legally separated, and was awarded 2 properties in the separation agreement. Do I need to file a quit claim deed to have the property transferred to me or is the legal separation paperwork sufficient? Brette Answers: You need to have the deed changed. Good luck. Angie's Question: After signing a separation paper, can he legally try to get any of my money before we file for divorce? Brette's Answer: If you sign a separation agreement and file it with the court and the court approves it, your assets must be divided according to that agreement. Money you earned after that is generally considered separate property but you need to check with an attorney to verify the laws in your state. If he is in violation, you can go to court and enforce the order. Are assets obtained after a legal separation marital property? Question: Once a legal separation has been granted and judgments set, are assets attained after that still considered marital property? Deneen's Question: I recently started a new business. It was started after the date on our legal separation paperwork. My husband thinks that he is still entitled to half ownership of my business. Is this correct?? I thought any new income after the date of separation was just mine? Brette Answers: It depends on what assets you used to start the business. If you used marital assets, those could be deducted from your share of the pot once the division is made. Talk with your attorney about this to get details. Why is child support owed if our state doesn't recognize legal separation? Heather's Question: If you're separated in a state that doesn't recognize legal separation, how are they able to take child support from your check without you signing any paperwork? Brette's Answer: Child support has nothing to do with a legal separation. It's available when a parent is not in the same home as the child. Christa's Question: My husband and I moved in with my mother while she had cancer. After she passed away, my sister and I inherited the house. The mortgage is still in my mother's name, but since my husband and I live here we make the payments. If we get a legal separation, will my husband be required to continue making the house payments since it isn't in our name? Brette's Answer: He can be ordered to make support payments to you. It's unlikely a court would order him to make mortgage payments on a house he doesn't own. Kim's Question: My husband and I are getting a legal separation, and he would prefer to give up all the life insurance policies. Is there any way I can prevent him from disposing of the policies, should he actually decide to do so? Brette's Answer: Life insurance can be part of the property disposition as ordered by the court and a spouse can be ordered to maintain life insurance as part of a spousal support order or a child support order. Does he still have financial obligations if he moves out? Dawn Asks: My husband moved out and we are currently going through the motions for separation and divorce. He does not want the house and I have applied to have the mortgage in my name. We both have payroll deductions to pay for a line of credit, the mortgage, and house insurance. He claims that I owe him for the payroll deduction because he no longer lives in the house. Do I owe him the money? Does the fact that he has moved out mean that he no longer has any financial obligations? Brette's Answer: You should discuss this with your attorney. 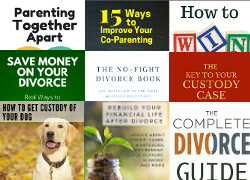 When a couple is in the process of divorcing it is almost impossible to suddenly separate out your finances. Instead, it is a process that takes time. When your property settlement is finalized, it will be done in a way that takes into account all payments made by both of you during the separation. I'm a stay a home mom and he refuses to pay the rent after moving out. Krystal's Question: I don't work because I'm caring for our 2 1/2 year old. My husband recently moved out of our apartment and refuses to pay the rent. What should I do? I'm really worried and I have a month to find a place to live. Is it okay to date if you're legally separated? Jamie's Question: If you are separated, can you still have another intimate relationship with someone else, or will that still be an affair? Brette's Answer: When you are separated you are still legally married to your spouse, so technically having a sexual relationship with someone else is considered adultery. As to whether it is ok to date once you have physically separated, that is something you need to discuss with your attorney. It depends on the type of case and what exactly is happening. Practically speaking, most people do feel free to date once they have physically separated. You have to do what is right for you given your circumstances and what fits your belief system. Good luck. Can I date before I get divorced? Anne's Question: Can I start a new relationship even as the divorce process is on, though he has not agreed on the divorce? Brette: You can, but you should consult with a lawyer about how it could affect your case. Adultery could be a problem for you. Topic: Can a person get engaged during a legal separation? 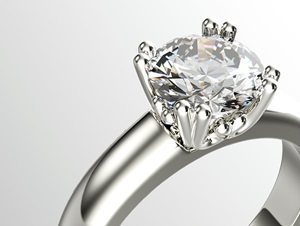 Kendall's Question: Can a woman become engaged to a man who is legally separated and is waiting the year required before the divorce can be obtained? Brette's Answer: An engagement has no legal meaning, so yes; someone who is still legally married can get engaged. State law varies about turning separation into divorce, so talk to an attorney to get details on your specific state. However, if you don't want to wait the year, you can use another grounds for the divorce and go ahead with it right away. Can you remarry if you are legally separated? Beatrice's Question: I am engaged to a man who is legally separated. Can we get married now, or do we have to wait for the divorce? Brette's Answer: A person who is legally separated is still legally married. You cannot marry until he is divorced. Can I remarry if we've been separated for 7 years? Jenn's Question: If a married couple has been separated for 7 years and they both live separate lives (but not legally separated) can they marry other partners without going through a divorce? Brette's Answer: No. A legal marriage must be ended by a court. How will it affect my divorce if I move in with someone while separated? Stephanie's Question: I've been separated from my husband for about 9 months now. I want to move in with someone but am unsure of the effects that it will have when I do eventually file. We have a child together. Brette's Answer: Moving in with another person is something most attorneys advise their clients to hold off on if they can, but each person has to do what is right in his or her own situation. You'll still be entitled to child support if you move in with someone. Your living situation does have an impact on custody, so keep that in mind. Good luck. If I'm legally separated, can I lose custody if I move in with someone? Pat's Question: I have met someone else and would like to legally separate from my husband. I have two children and am afraid that I will lose them if he finds out about my new relationship. Can I continue my new relationship without losing my children if I'm legally separated? Brette's Answer: You should consult an attorney in your state so you can fully understand the ramifications. Generally, because you are in a new relationship, it should not affect your chances for custody, as long as the relationship does not adversely affect the children. For example, if a new partner is abusive, does not treat the children well, or if the new relationship causes the parent to be less attentive to the children, these would be ways in which it could adversely affect the children. Annie's Question: My husband moved out, we are separated and I am still in the home with my kids. He has his girlfriend sleep over once a week at his rental and he is telling me I can only have my boyfriend sleep over one time a week. Does he have the right to say that? Brette's Answer: No. He has no authority over what you do. Kimberly's Question: I was wondering, are we able to still file income taxes together if we're going through a legal separation? Ann's Question: Can he make a will or transfer any car, property, asset to someone during our separation process? Brette's Answer: He can make a will but most states have a right of election for the spouse that gives you a definite share of his estate even if he writes you out of the will. He can transfer things if the court has not ordered him not to, but if it was marital property, it will still count in the property settlement. Renee's Question: If my spouse has moved to another state with another woman, but has not changed his address, is this legal? What about our children; should I proceed with temporary custody?